There’s barely a bump beneath Jocelyn Robles’ gray T-shirt, but she already knows the baby is there — and that the child she’s carrying suffers from a rare and fatal birth defect known as anencephaly. So the 23-year-old farmworker from Yakima, Washington, had questions Tuesday night for the health officials, scientists and other experts gathered to discuss the cause of an alarming local spike in the disorder that leaves babies missing parts of the skull or brain. “At this point, you don’t know anything about that, right?” asked Robles, whose baby is due on Halloween. Since 2010, at least 30 babies — now 31 — have been diagnosed with anencephaly in a three-county area of central Washington state that includes Yakima and Sunnyside, where Robles grew up. That’s a rate of 8.7 per 10,000 births in the region, far higher than the national rate of 2.1 cases for 10,000 births. The problem has stumped Washington health officials, who say they can find no common link or exposure to explain the rise in the severe defects first noticed by a nurse at a rural hospital in 2012. They say many small clusters of birth defects turn out to be nothing more than coincidence. “We would love to find a smoking gun,” said Juliet VanEenwyk, the Washington state epidemiologist who helped lead the review of medical records that detected the problem. Now, state health officials have turned to the public, including about three dozen people who showed up at the Sunnyside Community Center for the first of two public “listening sessions” designed to gather citizen input before a high-level advisory group decides how to move forward. The second one is Wednesday night in Kennewick. The group may have been small — and local residents may have been outnumbered by health care advocates and members of the media — but they demanded answers just the same. “What might we expect here? What’s likely to happen here?” asked Dr. Dean Effler, a Toppenish, Washington, pediatrician who attended the session. Others wanted to know exactly how long the problem had been going on, whether it could be linked to diet, occupation, geography — or the Hanford nuclear plant in nearby Richland. State officials reiterated their previous answers — no, no, no and no — and said they planned to come up with new ideas for investigation at meetings that are set to begin in mid-June and continue throughout the summer. That could include detailed interviews with the dozens of women whose babies have been born with neural tube defects, including anencephaly and spina bifida, VanEenwyk told NBC News. “As we move forward, we’ll look for what is useful — and feasible,” she said. The would be a logical plan, said Allison Ashley-Koch, an anencephaly expert at the Duke University Medical Center for Human Genetics who is not part of the new 16-member advisory panel led by Dr. Kathy Lofy, Washington state health officer. Such a close look could point to — or rule out — possible links to the birth defects, including pesticides, grain molds, nitrates in water supplies and other concerns previously tied to the problem, VanEenwyk said. One factor that’s certain to get attention is the low rate of folic acid use in the region. Low levels of the B vitamin in early pregnancy are known to increase risk of anencephaly, spina bifida and other neural tube defects. Sixty percent of women in the three-county area don’t take folic acid as recommended — a figure that climbed to 80 percent to 90 percent in those whose babies were studied. But VanEenwyk also noted that many clusters, including those with higher numbers than the Washington cases, are never solved. “The bad news is, most cluster investigations don’t find a cause,” she said. That’s frustrating for longtime local residents Don and Shirley Dufault, both 68, whose son, Christopher, was born with anencephaly in 1977. “I believe it is an ongoing problem and I believe that the environment might have something to do with it,” Don Dufault said. 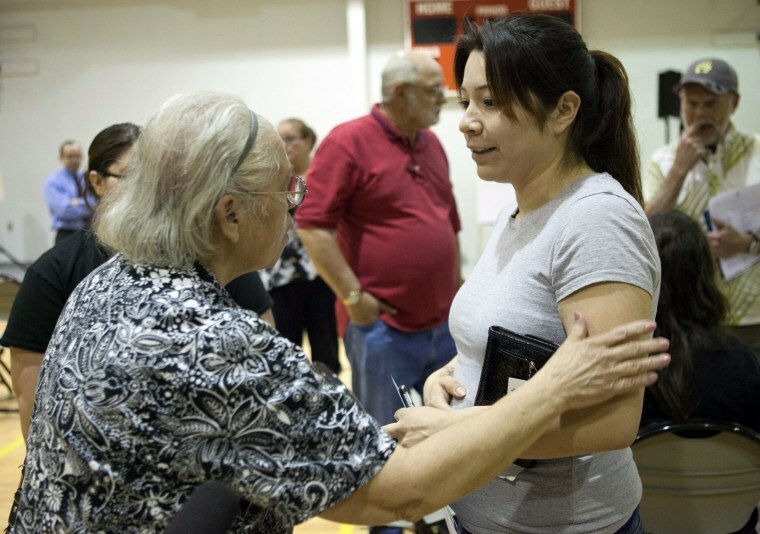 Shirley Dufault offered a hug to Jocelyn Robles as the meeting broke up Tuesday evening. Robles, who has a healthy 4-year-old son, said she came for answers but left with more questions.